Modern luxury doesn’t happen overnight. Celebrity is constantly improving on your cruise experience. In fact, the Infinity experienced a grand makeover in October 2015. The Rooftop Terrace gives you a chic new way to experience the great outdoors. If you hunger for an Italian steak house, savor the fresh pastas and dry-aged steaks of Tuscan Grille. 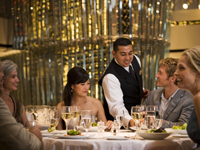 Enjoy a unique dinner at the innovative Qsine®, then top it off with a chilled Peartini at the ice-topped Martini Bar. Culinary excellence. Intuitive service. Luxurious accommodations. And stunning design. That's the Celebrity way. Celebrity Infinity is visually stunning and superbly designed. Enjoy the spaces that have welcomed guests back time and time again; explore her new Solstice Class® features—AquaClass® accommodations, the Celebrity iLounge℠, an ice-topped Martini Bar, Café al Bacio & Gelateria, the Qsine® specialty restaurant, and more. Exhilarating days of discovery deserve exceptional spaces to recharge. Celebrity’s range of luxurious accommodations has been artfully created to make your stay warm and welcoming. The Penthouse and Royal suites have glimmering new marble touches, elegant fixtures, plush seating and more. 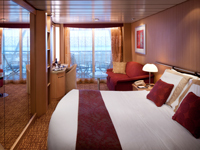 Or, relax in our spa-inspired AquaClass® staterooms, with access to the "clean cuisine" of Blu. Revel in stylish design. Sink into exquisite bedding. Bask in breathtaking views. Watch the world go by in modern luxury.